Essayist, poet and marine biologist Eva Salinas studied killer whales in Alaska’s Prince William Sound for nearly thirty years. She was drawn deeply into the lives of a single extended family of endangered orcas struggling to survive in Prince William Sound, and in 2014, published Into Great Silence: A Memoir of Discovery and Loss among Vanishing Orcas. At age forty-five she was diagnosed with metastatic breast cancer. Five years later she died, leaving this last brilliant volume of essays for the still living to ponder. What was I looking for so eagerly in Becoming Earth that I hadn’t already enjoyed in the vivid prose and poetry that emerged from her braided life as a whale scientist, a woman, and lover of wild Alaska? Or more specifically: that I hadn’t already read in a long line of cancer memoirs, including Eve Ensler’s In the Body of the World, Terry Tempest Williams’ Refuge, Deena Metzger’s Tree, Marion Woodman’s Bone, Kelly Corrigan’s The Middle Place? Before the robust evolution of the modern nature memoir, Rachel Carson’s magnificent Silent Spring was the best we had to help us understand the corporate-sponsored killing of our bright and beautiful world. What Carson did not share with us was her own cancer story. She died too young, a private person known for her scientific brilliance, her courage as a spokeswoman against DDT, and perhaps most of all, for her exquisite prose. But the confessional aspects of contemporary memoir would not have interested the reclusive Carson. In Becoming Earth, Saulitis draws from the wisdom traditions of Carson and many other writers and poets including Stanley Kunitz, Christopher Hitchens, Anna Kamienska,and Sogyal Rinpoche. Yet Eva’s stories remind us that just like the whales, the human body dwells within the body of the Earth, and shares her fate: “My personal cancer trauma…like eveyone’s—was bounded by trauma in the larger world: the Deepwater Horizon oil spill in the Gulf of Mexico during my diagnosis and treatment, and then, in Hawaii during my recovery, the earthquake and tsunami in Japan.” Eva Saulitis is of our time–was of our time–and my hope is that the personal nature of her account will spur us to heal the Earth we have damaged so badly. “I witnessed sources of that abuse during childhood drives to Buffalo to visit my parents’ immigrant Latvian friends, the thruway taking us through the steel mill town of Lackawanna, with its spewing stacks and grimed-up row houses…we came of age an hour’s drive from Love Canal, downwind of Three Mile Island, on the heels of Silent Spring. Even though I have spent many days of my life in doctors’ offices, chemo infusion labs and radiation waiting alcoves, accompanying my own loved ones on their journeys, I have not done this as a patient. I prefer (don’t most of us?) to pursue what seem like the more pressing matters of living, not dying. In Becoming Earth, Saulitis is a pathfinder for all of us, as she peels back the layers of her dying process. Because we live in a time and culture that hastens not only our own deaths (through cancer) but the extinction of so many other species, we are honor-bound to learn from what Saulitis offers. It may be that only if we can open our eyes and our hearts fully to the painful realities of our time can we find a way forward. What I want is for Eva Saulitis’ book to spark the transformation of a culture dissociated from the Earth, and from the fact that we have permitted poisoning of our earth. And recognition that that poisoning is resulting in an ever-increasing human suffering and death through cancer. I want to know that even though her body has been returned to the Earth, Saulitis’ words on the page will help each one of us engage in the struggle to move our culture away from warring on its own bodies. Some of that work will be educational, some political, but we are called to stand up and speak out as protectors of life. “Death may be the wildest thing of all, the least tamed or known phenomenon our consciousness has to reckon with. I don’t yet—might not ever—understand how to meet it. I stumble toward it in the dusky conifer light.” In Becoming Earth, we are privileged to walk beside her. 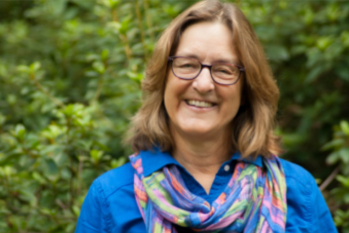 Susan Cerulean is a writer, advocate and naturalist based in Tallahassee and Indian Pass. Her most recent book, Coming to Pass: Florida’s Coastal Islands in a Gulf of Change, won the Florida Book Award’s Gold Medal for Florida Nonfiction in May 2015.